Yeah. It’s a bummer. You’ve booked your Thailand trip, but it’s the middle of winter and you’re not summer body ready. The beaches are calling your name, and with the country’s prime resorts and warm atmosphere, we know your winter layers are coming off (and then some, probably.) Most of us like to look our best when they do. The cold weather back home and huge helpings of delicious holiday meals are not a great choice just before a trip where your shirt might be off more often than it is on. 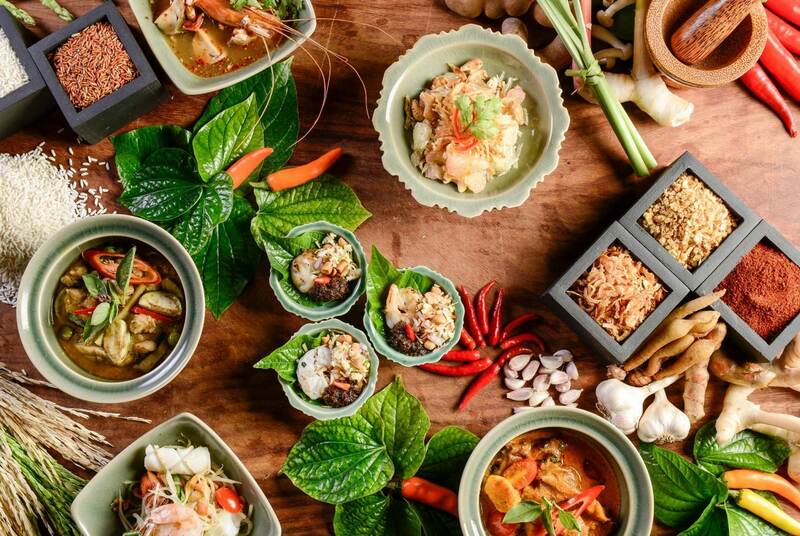 For those that truly desire to trim down their winter waistline and tone up before visiting for the New Year or Songkran Festival in Thailand, some the country’s great cuisine can definitely help you get there, and get you prepared for what to expect when visiting. Those familiar with Thai cuisine have known it for a theme of little to no conventional dairy, and lots of spice. Coconut milk is a cooking mainstay for many dishes in Thailand. There are plenty of dairy alternative versions that can be found commonly at your local supermarket. Coconut milk is a good source of medium-chain triglycerides, a type of saturated fat that some researchers think can help with weight loss. If you can take the heat, you might be able to burn off some pounds in a different way. Spicy foods flavored with ingredients such as chilies contain capsaicin, which may help you drop a few pounds by helping to decrease your appetite by making you feel fuller. Additionally, spice raises body temperature, which may increase the number of calories and energy you expend. Anyway, enough about the ingredients — let’s put them together and get your meal prep ready. Just for today, let’s Go Thai Be Fit. Salads make many think that a lack of calories equals to a lack of flavor or the food tasting bland, especially when eating them for dietary reasons. This doesn’t apply in Thailand. Each salad is bursting with its own variety of spice and flavor. One example of this is Som Tum, known in English as green papaya salad, which is filled with crisp shavings of the fruit melded into a spicy chili-lime dressing. On the other hand, If papaya isn’t your thing, Yam Mamuang is similar to Som Tum, but incorporates an alternative to the spiciness of the green papaya salad, utilizing sour green mangoes instead of shredded papaya and is countered with the saltiness of fish sauce and lemon. Alternatively, if you want to cheat the system and get a little bit of protein into your diet, Yum Talay may do the trick. The dish mixes meat or seafood atop salad greens and is mixed with fish sauce, lime juice, chiles, and herbs. It’s also served as a soup if you’re looking for that — just watch out for your sodium intake. There’s a lot of different ways to have your fish served in Thai cuisine, but some of them are counter-intuitive to slim-down health goals, particularly due to the fact that some of those delicious recipes require frying. Because of that, we’re sticking to a healthier option of steamed fish. For pla kapong neung manao, barramundi (Asian sea bass) fish is steamed, covered in garlic, chilies and mint leaves. Although barramundi is the common choice to use if you want to cook an authentically Thai recipe, there’s nothing wrong with switching up the fish in order to keep your meals dynamic. Chicken Satay is a common dish found hawked by street food vendors all over Thailand. Not only is it a genuinely healthy option for carnivores, it’s also a flavorful one. Similarly, the recipe is simple, cheap, and quick to marinate and cook. Although they are often served with a small variety of dipping sauces, you can definitely live without it if you’re looking for a leaner lunch. Pro tip: avoid the pork variant. Although undeniably delicious, it has a much higher fat content than that of the chicken. Thai food can be healthy, but like all cuisine, there’s a limit to what you can get away with. When cooking or ordering, try to avoid dishes that are fried, high in sodium, and have high saturated fat content. These are all common ingredients of many different recipes in Thailand. In addition, although coconut milk has some benefits, it is a major source of a lot of the calories and fat found in Thai recipes. Like everything, moderation is important. Try to remember that one when you’re celebrating here during the New Year. Actually, maybe you can disregard that rule once you’re in the country. After all, what’s a vacation if you can’t enjoy it the way you want to?